A Massey Knakal sales brochure for 'Inisfada', the Nicholas F. Brady estate designed by John Torrey Windrim c. 1919 in North Hills, currently listed for $49,000,000. Click HERE for more on 'Inisfada'. It will be very interesting to see how this develops. So sad....I highly doubt the house itself is protected. I'm sure they'll tear it down. Does R3-Residential zoning protect the building? Who could justify paying over 3million in property taxes to keep the property intact??? There's likely little that protects the house at the end of the day. My best guess is that the surrounding property gets turned into a condo development...with the big question being if the house can become a club house for the community or else fall to make room for more condos? The price is pretty ridiculous...if you just considered it land they have it priced at almost $1.5 million an acre. In this case it would seem impractical to demolish the house. While surrounding it with townhouses is what will probably happen, (and they will look awful and cheap in comparison to the mansion) there also is the possibility of some institutional, tax exempt or commercial usage if the town and community is willing to make some compromises. Whatever happens, it is without doubt a great deal of the magnificent interiors will no longer be suitable and be removed, while maybe retaining the significant major rooms. While the church lovingly maintained and protected this property over the years, I am disappointed there is no protective covenants written into the sales terms. Hopefully the town will do the right thing since a good example of what not to do lies just over the town line in North Hills, where a bucolic village of old estates has been bulldozed into an endless sea of condos and cul-de-sacs thoroughly wiping out almost all traces of the villages history. FYI: for anyone interested, a house tour is planned for October 21st. Details are on the St. Ignatius Retreat House website. May be your last chance. Well, one can't help but observe that the housing that surrounds it is not the sort of housing one expects to find on land that is 1.5 million an acre. That very dense housing also doesn't look to be that many decades old, so one assumes that the land was sold within the last 25 by the order in an attempt to keep the house going a while longer? A real conundrum. How do you suppose they arrived at that price? I know nothing of real estate values in that neighborhood, so I'm curious. One also has to point out that few town boards have the magical authority to conjure up ordinances out of the blue, let alone ones that have real world solutions to very complex problems, even if they want to. Mom used to be a frequent visitor there -- if memory serves, it seems it was less than two decades ago that the land was sold off for the current condo development, purportedly to reduce the tax load & fill the coffers. At the time it was considered an unpopular but necessary evil for it patrons. For those not too familiar with the immediate area, there are a string of condos on both sides of the LIE (mostly north side) go for obscene amount of money & yet another development could easily justify the $1.5M/acre pricing. What is it they say about location, location, location? L'il gay Boy just made me realize my blogging name could stand for Northern State Parkway-it doesn't. Archibuff-sorry to say, Inisfada is actually located in North Hills (I always thought it was Manhasset, but, alas, no). I agree the price is high but I believe it is half acre zoned, so a dense development could probably yield 50+ lots. 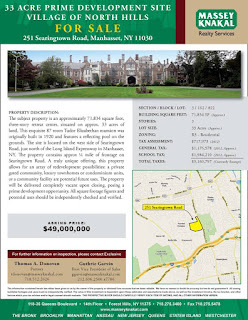 NSP Ahhhh I tought so, but the listing is touting Manhasset as the address. I too would want to avoid referencing North Hills. Unfortunately North Hills will do very little to protect the building so it is up to a creative developer to ensure its survival. The building being in great condition also helps. Almost too massive to remove, one realistically has to work with it under any sceanario. The condos between the highways on the former Seventh Day Adventists property went for insanely high prices during the recession. Does anyone know the time of the house tour this Sunday? Not listed on the site. So sad to learn the news of this sale; I had hoped the retreat operation would continue its admirable stewardship of the house. thereby preserving a signifcant remnant of Long Island's past. Hoping against all odds the house will be saved withoutb alteration. 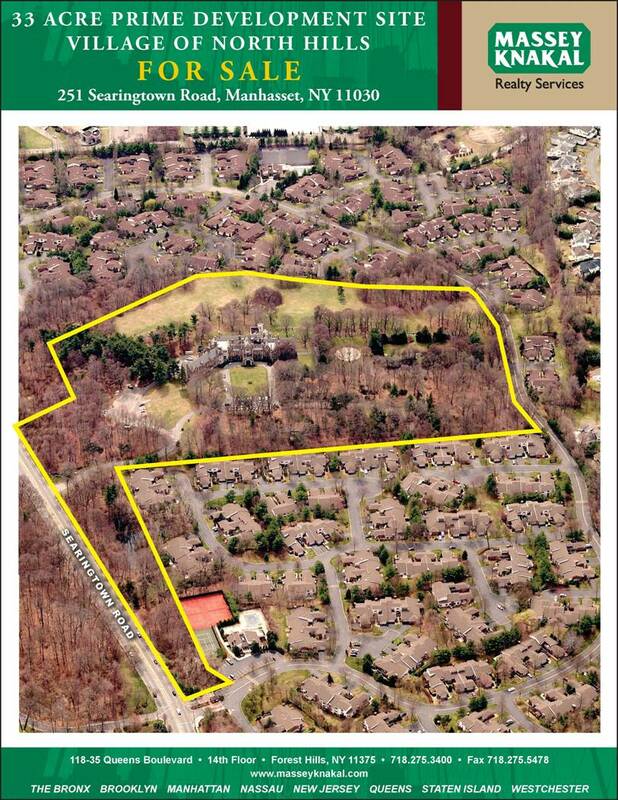 One would wish that North Hills could buy it to join with Morley Park, but at 49 million, that seems an untenable dream---as Long Island becomes ever denser, any amount of open space is ever more important. It is amazing to compare this to Northwood in Oyster Bay--where the town stepped in and bought a large portion of the property---for far less money. I must admit, sitting up here in Maine, at how much the taxes are in Northwood. Out of curiousity, I picked several large properties up here---though none with a house of quite that magnitude--none survive--and even some of the top taxpayers, with far more land, far more buildings, and ocean frontage, pay under 150,000, and in most cases, under 50,000--including Martha Stewart's lavish 'Skylands', a 35,000 sq.ft house, greenhouse, huge garage with apartments on 60 non-oceanfront acres in a far more elegant neighborhood than Inisfada, pays a total of $57,000. Apples and Oranges, I realize, but quite different from $3,000,000 at Inisfada. So, the question to the group is, what are REALISTIC scenarios for this property from here? I meant 'realistic uses', not scenarios, oops. All the community ordinances in the world don't save the property if there isn't a sustainable plan for the building. Typo on previous comment - it should be Lenox, Ma., not Lenos , Ma. Also, it strikes me that the price is such that they are charging for the building as well as the land - a good sign since it may mean that it would be to their economic advantage to keep the building. What's key about how the developers handled the conversion here is that it was done vertically, not horizontally. It's conceived as a series of very posh semi-detached houses instead of an apartment house with units separated by floor and opening onto long corridors. The way they did it at Tyninghame, each unit has at least one major downstairs room and the adjacent upper rooms. This means a lot less chopping up of large spaces into smaller ones and consequent damage to original fabric, plus it results in units that, being more like a real house, would probably have more appeal to an upscale clientele. I can't imagine anyone with deep pockets wanting to live there if they sell off any more of the land, however. There has to be outdoor amenity space, most of it common but also private gardens connected to each of the units. The Savils listing has all the floor plans and more photos. The difference between American and British country houses that are converted to flats is usually that while the American versions are surrounded by crops of houses on land that used to be part of the estate, their British counterparts are surrounded by crops tout court: the valuable farmland has often been sold off, but remains as open space. Excellent points---esp. about the vertical division vs. horizontal, and of course, the land. Just so different than how houses get divided here. north hills is as upscale a neighborhood as one can find on long island for all the unwarranted disparaging remarks pertainig to the housing surrounding insifada. The local shopping and school districts are unequaled. Most condominiums and homes sold in recent years were well in excess of a million. please check facts. ^ That's more of an opinion. I don't think anyone would say a place like North Hills and Mill Neck are anything at all alike. referring to north hills not possessing the neighborhood to support high end housing at inisfada please note the ritz carlton complex has garnered brisk sales through the real estate meltdown on units priced between 1.5 and 5.0 million in a very high density development of four story buildings. apologies if north hills still isnt quite high end enough for some commentators. Of course, even people who live in Mill Neck have to drive through a lot of eye cr*p before they arrive at their destination. The buffer protecting such places from ugliness is larger than the one around Inisfada, granted, but in Inisfada's case the destination itself has a LOT going for it. I remain hopeful that there could be a positive outcome for the house provided someone with more than half a brain takes it on. I don't know what I said to cause these comments to become personal and snippy. I was agreeing that the English in general tend to be way ahead of us in imaginative re-use of country houses (and in preservation thereof in general), agreed that it would be a wonderful use of the property, and that open space would have to be maintained. I was hardly suggesting that North Hills or the neighborhood around Inisfada were slums, and as far as checking facts goes, am perfectly aware that real estate prices are strong there. Nevertheless, as Zach points out, North Hills is not Mill Neck, and the density around Inisfada is likely not an attractive selling point for lavish condos. I'd be thrilled to be proven wrong, should a creative developer purchase and divide the house and sell the apts. for millions. PS, as far as 'going through some crap' to get to the nice places, that's true everywhere and has been ever thus---look what Daisy and Gatsby drove through to get to the Eggs. Not to be a naysayer, but when a property is sold off at a premium it almost certainly kills any chance for a residence to become an Inn or B&B with economic success. B&Bs which organically convert from a private home to an enterprise have a far better chance to survive. I'm often dumbfounded when its suggested a buyer should acquire a property for millions and then make it an Inn. Only if you look at a financial return over 30+ years does that even begin to make sense. Unless the location is extremely unique the general market for premium, niche B&B space simply isn't that robust. Hence Oheka after taking on a tremendous amount of debt - yet having a healthy amount of bookings - is now facing trouble. Costs for taxes, upkeep/maintenance, insurance, furniture, upgrades, and most importantly staff isn't going anywhere but up. The days of boondoggles with corporate conferences at a resort are shrinking. Shelburne Farm, Elm Court,Goodstone Inn (M'burg VA), Blackberry Farm in TN, etc these were family homes that the owners transformed into inns slowly. My guess is that areas like Mill Neck are more to the taste of most of the readers here because more of the old North Shore quality remins intact. Those of us who remember how truly amazing North Hills used to be can't help but be a bit dismissive of its current status, as it certainly used to be more attractive, special and unique. There are also many of us who were upset by the more recent demolition of the mansion that stood on the site of the Ritz-Carlton residences. 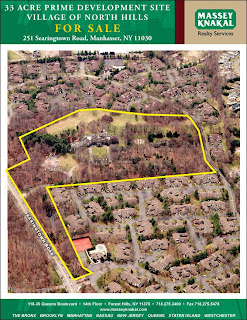 Worst of all was the village government's voiding of the conservation covenant, in exchange for a large sum of money, that allowed for phase 2 of the absurd Chatham condominiums to be built, thus destroying some of the Long Island's finest remaining old growth forest. 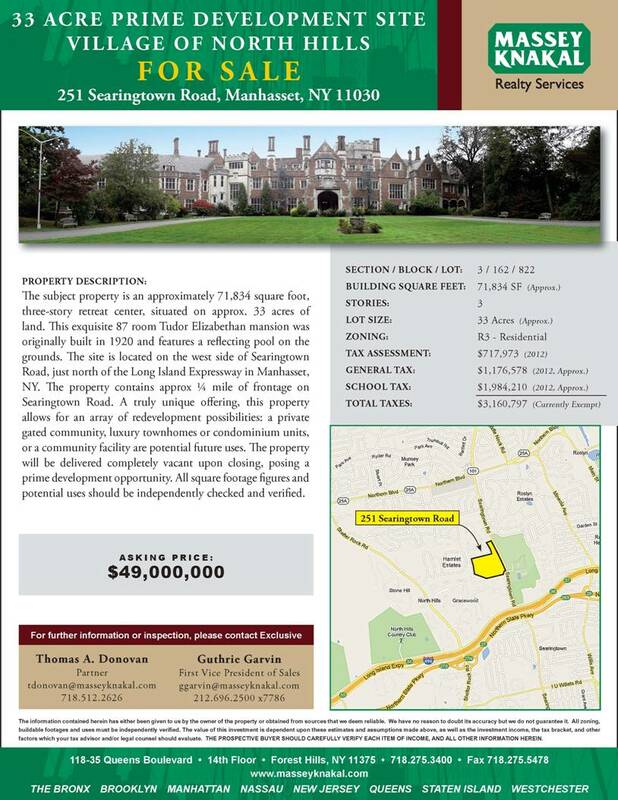 That said, there is no question that North Hills is considered a highly desirable place by many, is quite affluent and does provide an easy commute and many more upscale suburban amenities than most of LI. It is for these reasons that I think Inisfada could work as a very high end "clustered" subdivision of luxury, reasonably sized pied a terres with the main house being divided into multiple residences and perhaps some great common spaces for the residents. High end services (along the line of the Ritz-Carlton residences) would also probably work. Finally, I think the old Breese estate in Southampton is a good U.S. example of a "horizontal" division of a mansion and one of the better examples of a well done residential reuse. that could be applied here. At the risk of appearing prejudiced or insulting, the elephant in the room that no one has addressed is the type of people drawn to live in these areas. Long Island is a patchwork of communities that attract like-minded individuals. It's been long accepted that many Long Islanders look upon the North Shore (in general) as a more wealthy & cultivated area of multi-acre housing, whereas the phrase "South Shore" is sometimes a disparaging comment on what one could look upon as "Amy Fisher-ville" -- hardly a desirable location (many with little more than 50'x100' lots), despite the fact that many South Shore communities, especially the closer one gets to the water, are quite upscale indeed. I hesitate to use the word, but the "class" of people who would deign to live in North Hills is far different from those who live closer to the North Shore -- being closer to the parkways is simply more important for what some may refer to as the "commuter class" than the more substantial, and sometimes older (or just exceedingly large), wealth that areas like Mill Neck represent. Yes, in its heyday North Hills was indeed lovely; but then so was Far Rockaway a century ago, but no longer is. I understand there is a foreign investor that wants to develop the grounds and either gut or demolish the mansion. There is a group (with backers) that would like their offer heard, but the Jesuits are not listening. The group s local and would like to keep the house as a non-denominational retreat house. This group's purpose would fit the situation better and they are local with business plan and capital.